Karnataka is an Indian state. 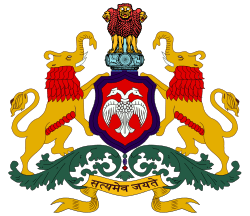 Several etymologies have been suggested for the name Karnataka. The region was popularly referred to as 'Karnata desa' in Indian history. However, historically, the names Karnatak or Carnatic have been misapplied to refer to the regions in or beyond the Western Ghats (Kodagu and Kerala) as well as to a region in present-day Andhra Pradesh (Telangana). The other accepted derivative comes from the Kannada words karu and nādu meaning elevated land, or from the Kannada words kal and nādu meaning rock country, referring to the rocky terrain of the state. The earliest known references to Karnataka are found in the Sabha Parva and the Bhishma Parva of Mahabharata, an ancient Indian epic. The Matsya Purana, Skanda Purana, Markandeya Purana and the Bhagavata Purana also make references to the name Karnata. In Canto 5 - Chapter 6 of the Bhagavata Purana, Karnata is mentioned while narrating the life of Rishabhadeva. It is said in the Bhagavata that the Lord in Rishabhadeva's form ended his avatara in the Kutakachala hill in Karnata province. Kutakchala is a hill in present-day Karnataka near Kollur in the Western Ghats. Scholars Pāṇini ( 520–460 BCE), Mrichchakatika and Kathasaritsagara make references to Karnataka in their ancient works. Later, in the 5th century CE, the term Karnataka was used by the astrologer Varaha Mihira in his work Brihatkatha and the Birur plates of Kadamba Vishnuvarma call Shantivarma The master of the entire Karnataka region. In the 7th century CE, Rashtrakuta inscriptions refer to the armies of Chalukyas of Badami as Karnatakabala. The Tamil classic Silappatikaram of the same time period calls the people of present-day Karnataka region as Karunatakars..The Kalingathu parani, a war poem written by jayangkondar in Tamil Literature calls a people of a region called 'Karunatiyar'. In the 9th century CE, the Kannada classic Kavirajamarga hails the entire region between the rivers Kaveri and Godavari as Karnata. In the 13th century CE, Kannada poet Andayya's works use the same terminology. In the late 16th century, a Telugu work Vasucharitamu refers to Tirumala Deva Raya (1570 CE), the first of the Aravidu (Aravithi) line of rulers of the late Vijayanagar Empire as the reviver of the Karnata Empire. All this clearly shows that the name Karnataka has been in usage consistently since ancient times. Karnataka's name may have originated from the two words Kabbu Nadu, which means land of Sugarcane. This etymology might be possible as Karnataka is a huge Sugarcane-cultivating land. But, this theory might not be very factual as Sugarcane production boomed in South Karnataka only post the building of KRS Dam by Sir M Vishweshwarayya. Before that the very same region of Karnataka was known for Ragi production. ↑ "Article from The Hindu national newspaper of India". Chennai, India. 2006-10-31. Retrieved 2007-03-10. ↑ "'Antiquity of Karnataka' - article from OurKarnataka.com Portal". Retrieved 2007-03-10.